Vancouver is consistently rated among the most desirable places to live in the Economist’s annual ranking of cities. In fact, this year it topped the list. Of course, it also topped another list. Vancouver was ranked as the city with the most unaffordable housing in the English speaking world by Demographia’s annual survey. According to the survey criteria, housing prices in an affordable market should have an “median multiple” of no higher than 3.0 (meaning that median housing price should cost no more than 3 times the median annual gross household income). Vancouver came in at a staggering 9.3. The second most expensive major Canadian city, Toronto, has an index of only 5.2. Even legendarily unaffordable London and New York were significantly lower, coming in at 7.1 and 7.0 respectively. While there are many factors that make Vancouver a naturally expensive market, there are a number of land use regulations that contribute to the high housing costs. Vancouver is a unique real estate market: it’s the only major Canadian city that doesn’t experience frigid winters. This makes it a major draw for high skilled, high salary employees. It is also a major destination for wealthy Canadian retirees, who choose to actually spend their winters in Canada. There is little doubt that it is a naturally expensive real estate market. As with coastal California cities, people pay a premium for (in this case relatively) hospitable weather. The proximity to world class skiing, fishing, and hiking are no doubt another factor in the city’s high real estate costs. There is certainly a premium to be paid for living less than two hours away from the world’s best ski resort. Moreover, Vancouver has become an appealing real estate market for overseas investors, particularly Chinese nationals. There has been a good deal of news recently about how many of the nouveau riche in China are now looking to Vancouver, rather than Los Angeles or New York as an immigration destination. In absolute dollar terms, Vancouver is still cheaper than either city. This, combined with the more hospitable Canadian immigration system, has made Vancouver so attractive to overseas investors that real estate agents are now organizing house hunting tours for potential Chinese buyers. 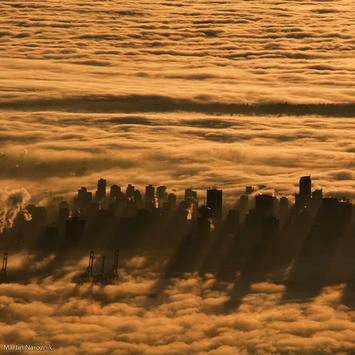 To be sure, geography deserves much of the blame for Vancouver’s high housing costs. But a large chunk of the blame lies with restrictive municipal and provincial land use policies. Since the introduction of the city’s first comprehensive plan in 1929, Vancouver has used various land use regulations to create dense mixed use development in order to protect green space surrounding the city. In 1972, the provincial government passed legislation aimed at protecting BC farmland. This left less than half of the already scarce land in Greater Vancouver off limits to developers. 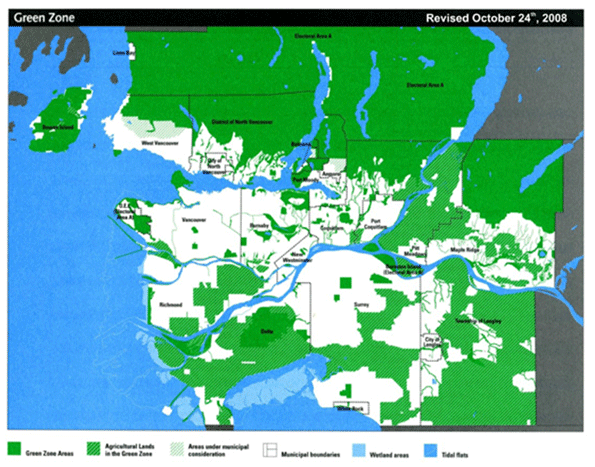 As a result, the city is circled by undeveloped land, referred to as the Green Zone. The Green Zone acts as a de facto urban growth boundary, largely designed to prevent sprawl. As a result, Vancouver is one of the few North American cities that have been growing almost exclusively upwards, rather than outwards for the last century. Its narrow streets and lack of a major highway running through the city make it one of the least automobile friendly cities on the continent. Unsurprisingly, Vancouver was ranked the most smart growth oriented city in the Pacific Northwest by the Sightline Institute. 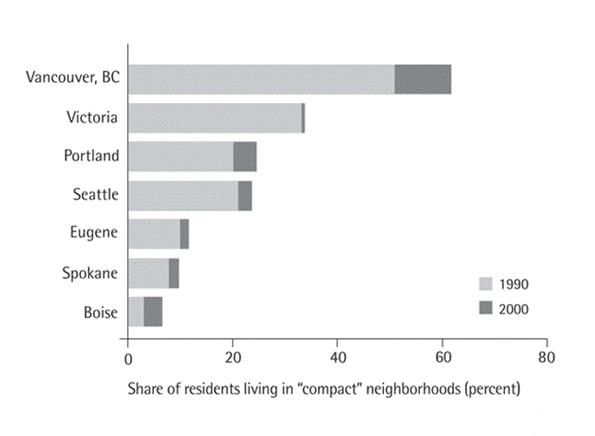 Roughly three times more Vancouver residents live in compact neighborhoods as a percentage of the population compared than Portland or Seattle. This arguably makes Vancouver the most smart growth oriented city in North America. Smart growth has become a truism for urban planners. Walkable communities with a mix of commercial and residential units combined with strict zoning regulations to encourage transit usage is a formula increasingly prescribed for North American cities. Though many smart growth principles are attractive, there is an strong correlation between heavy land use regulations and housing costs. Using data from the Wharton Residential Land Use Regulation Index (WRLURI), and Demographia’s International Housing Affordability Survey, a simple scatter plot diagram has been included to illustrate this correlation. The WRLURI measures the stringency of land use controls imposed on various US jurisdictions by state and local governments. 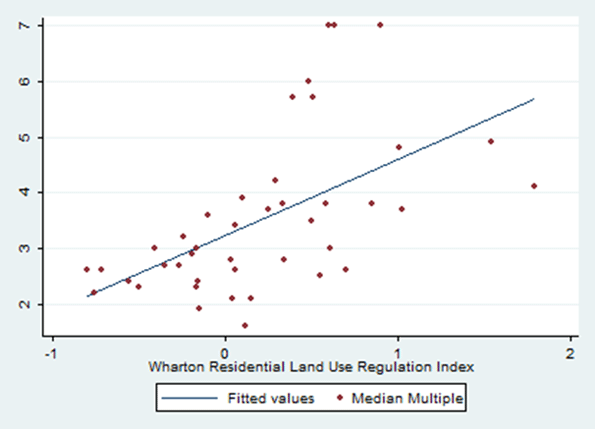 There is a clear correlation between high regulations, and low housing affordability. 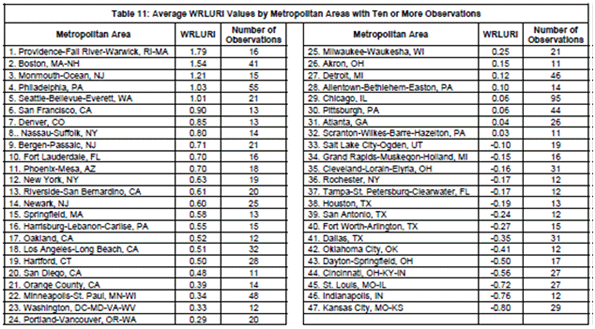 Though the index does not include Canadian cities, it does include neighboring Seattle. Seattle ranks fifth of 47 cities on the Wharton Index. According to a recent study in Boston College International & Comparative Law Review by David Fox, Vancouver is decades ahead of Seattle in terms of smart growth policies. This means that Vancouver would rank at least fifth in North America on the index, though it is more realistic to assume it would most certainly top the index. In addition to smart growth policies, Vancouver also has very stringent inclusionary zoning laws. Inclusionary zoning requires developers to provide a certain number of affordable housing units in any given development. This policy might seem to make the city more affordable, but it functions exactly like rent control. Those fortunate enough to find spaces in the affordable housing units pay less, but the subsidized rent is made up for by higher rent in adjacent units. In a study of inclusionary zoning in California cities, Benjamin Powell and Edward Stringham from the Department of Economics at San Jose State University found that inclusionary zoning imposes an additional $33,000-$66,000 cost on adjacent market rate units. There have been some recent policy initiatives that may reduce the cost of housing marginally. In 2004, the city amended its zoning code to permit secondary suites throughout the city. Secondary suites are subdivided units of owner occupied homes that are used as rental units. This zoning change brought tens of thousands of relatively low cost units into the market. There are currently 120,000 secondary suites in the province. The city recently went one step further to allow homeowners to convert laneway garages into rental units. These units have a maximum of 500 square feet. There are 70,000 homes in Vancouver that are eligible for conversion, though it is unclear how many will take up the offer. This will add to the stock of relatively affordable rental housing in the city, but may not significantly reduce housing costs. In fact, by increasing the revenue generating potential of houses, it may actually increase the cost of purchasing a single dwelling home. After all, if the potential rental income of a single dwelling unit increases, the market price of the unit is likely to do the same. This isn’t necessarily an argument against the policy, though it does underscore the fact that housing costs in Vancouver will never decrease without liberalizing municipal and provincial land use policies. In short, the City of Vancouver and Province of British Columbia have chosen to favor compact growth over affordable housing costs. This likely makes the city more attractive to affluents from both the rest of Canada and abroad, but increasingly makes it unaffordable for middle class families. There is certainly some substance to the Economist’s claim that Vancouver is the most livable city on earth. It is a very attractive place for those who can afford it. Nevertheless, creating a city fit only for the wealthiest segments of society and non-families is hardly something to be proud of. Steve Lafleur is a public policy analyst and political consultant based out of Calgary, Alberta. For more detail, see his blog. Submitted by lyle on Fri, 08/20/2010 - 15:51. There exists a large area with a similar climate on Vancouver Island. First have the province move more government over there (the provincial capital is over there already). Discourage business locating in Vancouver and encourage it on the island. Shut down local economic development efforts and instead sell how bad the place is. This will reduce the demand and fix the house price problem. This is a version of the old don't Californicate Oregon campaign. Perhaps go as far to put an extra tax on new jobs in the metro area. Submitted by Steve Lafleur on Fri, 08/20/2010 - 14:04. I'm pretty sure we're on the same page. I agree that the costs of sprawl can be enormous, and I personally dislike suburbia. I'd like to see the city and province allow more development in the green zone, and zone it for high density. Submitted by agustin on Tue, 08/24/2010 - 14:23. Then why not just increase density in existing low-density areas? Submitted by PhilBest on Fri, 08/27/2010 - 21:51. Alain Bertaud's work on Urban Density profiles reveals the following very interesting information. In a monocentric metro area without regulatory boundary limits, the density profile is like a logarithmic curve, high nearer the centre, and sloping gradually to near nothing at its edges. In a monocentric metro area WITH regulatory boundary limits, the density profile actually begins to slope "up" again closer to the boundary, at which point it drops to nothing (of course - that's the point of the boundary). But if you calculate the population's AVERAGE distance from the metro centre, under each model, it is the latter, regulated one that has the HIGHER average distance. This is because of the forced increases in density closer to the boundary, which is the result of the price of land being forced up by a factor of "tens of times". The outer areas, while still very expensive by historical standards (and compared to less regulated metros) happen to be the "cheapest option". The result of all this, is NOT a trade-off between mortgage costs and vehicle running costs, as some contributors have suggested above. It is that the poorer people who could not afford the higher property prices of the inner areas anyway, now pay many times more than they used to, for FRINGE living; on top of their vehicle running costs. Inner area living, with the land per property costing in the millions, is now LESS of an option than it EVER was. In fact, it is the less regulated metros with lower land prices throughout, where lower income earners MIGHT be able to afford an inner area home and make the trade off with vehicle running costs.